Secret Garden is tucked away on a quiet neighborhood street, only two blocks from the main avenue. Tulum Pueblo is a lively town with fruit markets, lots of restaurants (we have our favorites), internet cafes, mexican handcrafts and silver shops. All this is within walking distance from the Secret Garden. 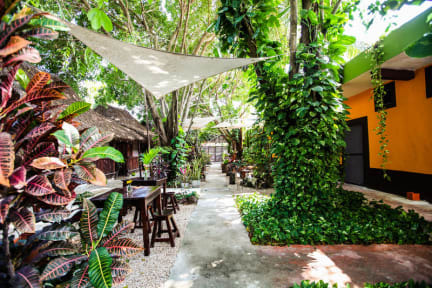 Our eight tastefully appointed rooms are ideally located only 4 kms away from Tulum's amazing beaches and ancient Mayan ruins. Also, we are close to the bay where you can swim with sea turtles and see amazing caves and 'cenotes'. At Secret Garden you will find clean, comfortable and stylish standard rooms each with air conditioning, queen size bed, full size bed or both (depends on the room), also we have bugalows; these are made with 'Mayan style' thatched roof that helps keep the space cool. The beautiful courtyard area has a great combination of breeze and shade. Perfect common area to read, relax or chill out with new friends. Bus station is 5 minutes walking distance. - Standard double bed private rooms (Bungalows) feature mini fridge. - Free coffee, tea and drinking water all day. Thank you Jorge! He was the attendant in the office for check in, but he helped us so much, he gave us local tips and tricks, guided us to amazing local tours, and even told us about the place (Play Santa Fe) where my boyfriend proposed to me. I cannot express how much he made our stay in Tulum. The rooms were always clean, very spacious, and the entire property is truly like a Secret Garden with lush trees and a beautifully planted garden in the centre. 11/10 would definitely stay again! Beautiful little bungalow just a 5 minute walk from the main street. Staff were incredible, super helpful and welcoming. The room was equipped with fans but the only downside is there was no air conditioning. Secret Garden is a beautiful, peaceful little hotel in town. About 8-10 rooms around a courtyard. Great location-- I walked to everything in town and took a bike out to the beach and cenotes (about 20 minutes). Our stay at the Secret Garden was lovely! The most helpful staff with the best recommendations. The common area is a beautiful tropical jungle with relaxing music, candles and good vibes.